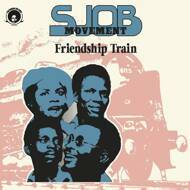 SJOB Movement's “Friendship Train” was the second LP by the group and one which saw the group rise to new heights. It's a masterpiece of African music with it's fluid afro beat grooves and spaced out Moog synthesizer sounds. Here is an excerpt from the liner notes written and researched by Uchenna Ikonne: ""Prince Bola Agbana might hardly be the most immediately recognizable name in the constellation of Nigerian music stars, but for a significant portion of the last half-century he labored in the shadows, dutifully serving as one of the key movers in its development: An in-demand session musician. An early and respected exponent of funk. A catalyst in the retrofit of juju into a modern pop genre. Most of all, though, he is recognized as the founder, leader, drummer and principal vocalist of the SJOB Movement. SJOB: Sam, Johnnie, Ottah, Bola. For a moment in the mid-1970s, they were le dernier cri in modern Nigerian music, representing the next step in the evolution of afro rhythms, and a new paradigm for the band economy. Their first album, 1976’s “A Move in the Right Direction”, was a minor sensation and was swiftly followed by “Friendship Train” in 1977. Then it appeared that the movement stopped moving, and SJOB disappeared from the scene.